The new model AIR 1 Strut, as light wind and foil boarder oriented variation of the Mr Fantastic 4th generation will convince you with a typical JN sportive performance. Thanks to a very powerful kite surface, in Full 3D-Concave-Shape, the Mr. Fantastic covers a wide wind range and offers easy handling by a simple and refined 4-line set up. The all purpose kite offers the necessary characteristics to all stages of rider skills and an On/Off power generation for beginners, tight turns and a stable well balanced flying character for more experienced foil-boarders, free- and wave-riders. 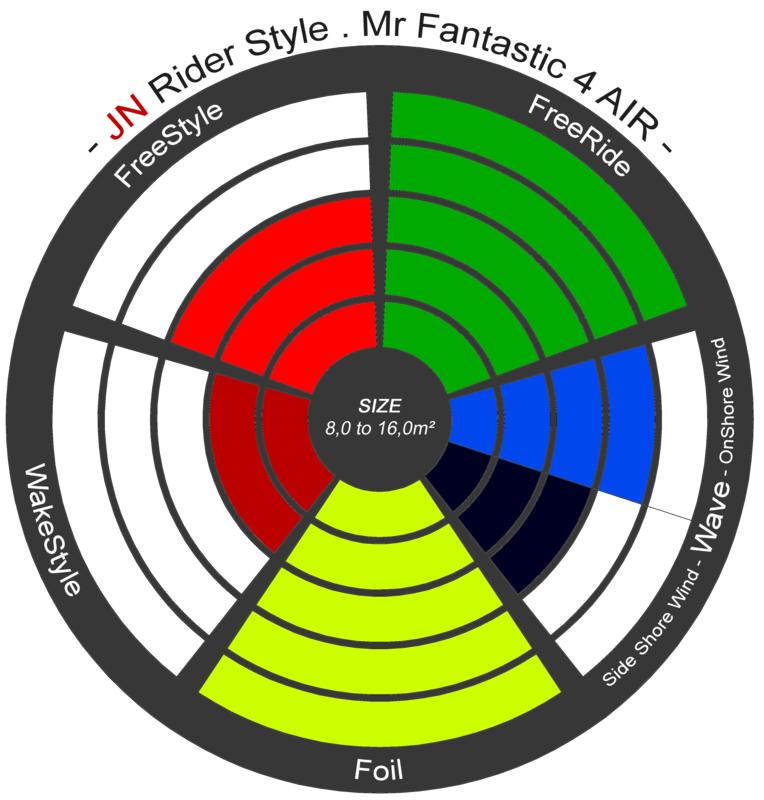 Mr Fantastic is shaped with a “swept back & concave” leading edge, which allows the rider to adjust the angle of approach as with other high depower kites, but without the loss of direct steering. 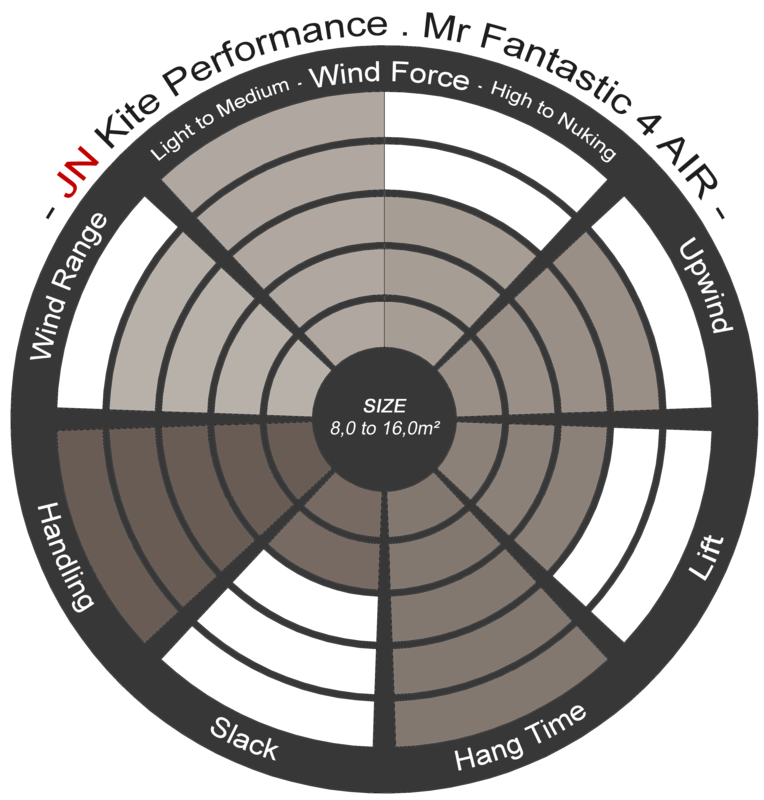 The JN specific canopy to tip construction gives the kite a very responsive and direct character combined with moderate bar pressure. The simple bridles support the increased angle of approach and additionally enhance the kite’s stability while offering a wide wind range. Innovative new Shape of the Leading Edge, by our new 3D software. The Concave provides better depower, greater range of application as well as fantastic relaunching, even in lighter winds. Canopy is optimized in all ares from tip to the center according to the real airflows along the cap. This provides better performance and efficiency, stable performance at the wind window and balanced flying ability with no front- or back staling.